In the aftermath of Invincible : The Death of Everyone, Dinosaurushas left his mark on the world. Can heroes from across the universe —Invincible, the Guardians of the Globe, Tech Jacket, the Astounding Wolf-Man,and more — contain the damage? Or are the end times of the InvincibleUniverse ahead? The greatest heroes in the Invincible Universe take on theirgreatest threats: Red Eye, the Lizard League, and...marriage?! 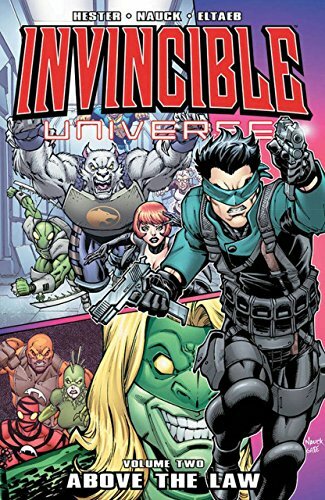 Collects INVINCIBLE UNIVERSE #7-12 The greatest heroes on the Invincible Universe take on their greatest threats: Red Eye, the Lizard League, and...marriage? !